Every year a group of hard working Brillantmont boarding students heads to a Model United Nations conference to test their skills in debate and public presentation. 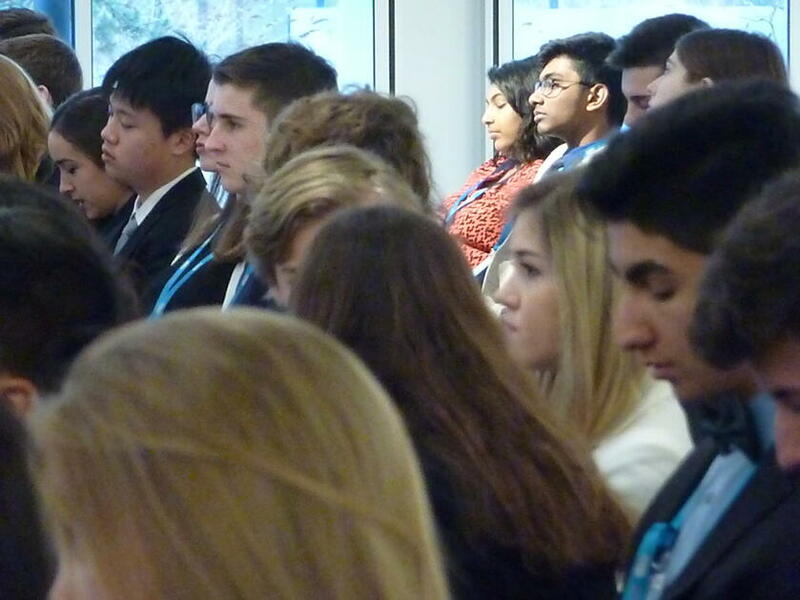 This year, our group attended the conference in the Hague. After experiencing this one-of-a-kind challenge, three students came back to Brillantmont and shared with us how this experience influenced them. The following are some highlights from these conversations. After a lot of encouragement, Leonardo from Brazil was convinced by a group of friends that he must try the Model United Nations experience. He said that he was glad he finally decided to see what it was all about because it ended up exceeding his expectations. There are very specific preparations that must be made before attending a conference: “Here in the MUN club at school we did a number of simulations to help us prepare. Mr. Mc Clean helped us a lot with the research on the topics and how to write excellent speeches. We also learned about how to respond to the parliamentary process.” In the months leading up to the MUN conference, students also learn about how the United Nations structure and proceedings works and how to navigate that in a debate. The power of language was something else that really stuck out for Tala. She noted how you have to use different words when talking in this formal context. You have to be careful how you phrase a question. This lesson is a very valuable one to learn. Ismael from Morocco has been attending Brillantmont International School for the past three years and is a senior this year. 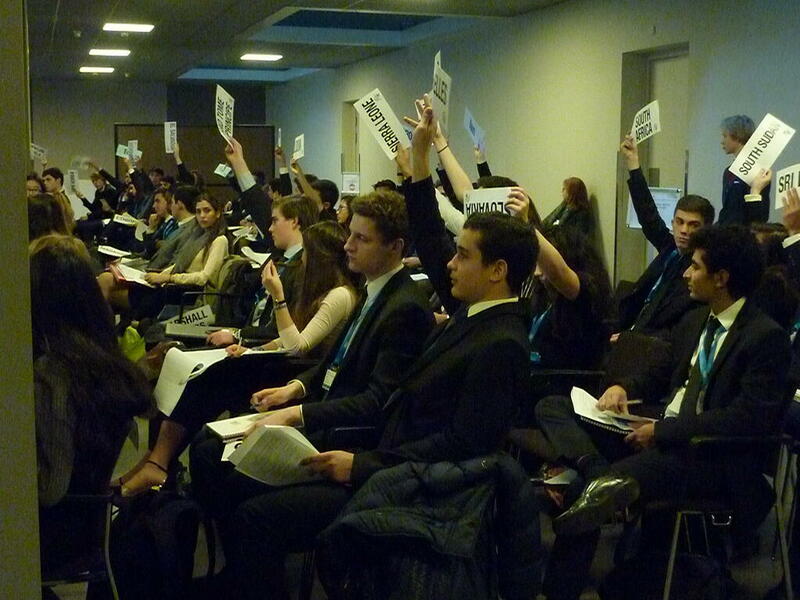 However, this was his first year attending a Model United Nations conference. This experience was so positive for him, that he has decided to fit in yet another MUN conference in Frankfurt before graduation - one that he organized to attend for himself as an individual, independent of the school. “I definitely want to do something related to the whole international world because traveling, and different cultures and languages is something I really enjoy. That’s the part of MUN I really appreciated: getting to know different countries and points of view.” There are many students who go on to do MUN in university, or lead groups of college prep teams, and this is something that interests Ismael as well. The skills you learn through an MUN experience - such as research, self-confidence, public speaking, and adapting your ideas to changing information when you do not have a lot of time - are all incredibly valuable to any future career. Ismael concluded by saying that this experience teaches you above all else to stay in the moment and think on your feet. Does this sound intriguing to you? Would you like to join in this challenging, yet rewarding activity? Since Brillantmont is a small boarding school, all students who wish to go get the chance to attend a MUN conference at some point in their time at the school. If you have attended a conference in the past and want to share your experience with us, please comment below!